How do I know if these certificates are credible? So, I give these away, now what do my customers have to do? How can Odenza offer these vacations at such low prices? How do I know Odenza will take care of my customers? What Free Marketing Materials and POP do I get? Roundtrip airfare for 2 plus 3 nights’ accommodations to one of three Mexican destinations: Cancun, Puerto Vallarta, or Mazatlan. The program will enhance your advertising so you can close more sales and capture more customers right away. Travel is the most widely appealing incentive – everybody wants a vacation, and a FREE vacation is that much better. Your sales people will close more sales, your customers will enjoy an exciting vacation experience and your business will grow. You can give away these trips very easily and gain a competitive advantage over your competition! Simple. 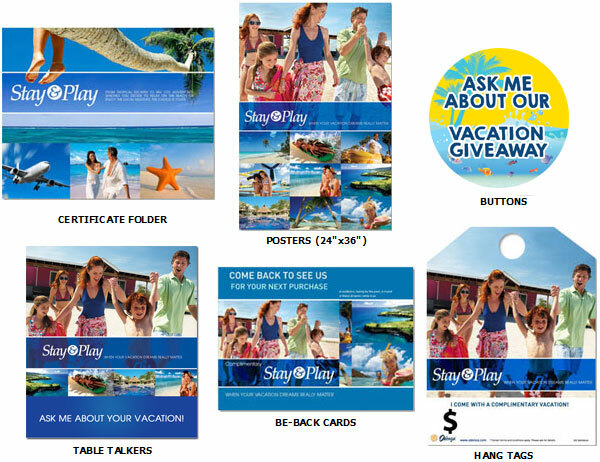 We provide you with the travel certificates and FREE marketing material. You place the FREE marketing material in your showroom, we’ll give you images for your website and images and copy to incorporate into your existing advertising programs (i.e. newspaper, flyers, direct mail, radio, tv ads) or whatever you currently do. Some customers will be attracted by the advertising, some by the in-store POP, and some will buy when your sales people use the Getaway to motivate the customer to BUY TODAY. When the customer makes the purchase, you simply hand them the certificate – we take it from there. Our travel department will take care of everything else beyond that point. Odenza’s in-house travel agency is staffed by certified and experienced travel agents who work directly with your customers to book their vacations. An average of net 5-25% increase on the ROI of your advertisting budget is common. “We’ve been using Odenza’s cruise products since we’ve opened the doors over a year now, and it’s been very effective in growing our business. It keeps our clients in touch with us!” Yellow Brick Mortgage Ltd.
1. Making sure the travel incentive is the right one based on what you are trying to achieve, be it getting more referrals, closing more deals, or rewarding your staff for excellence. 3. We offer a FREE conference call at the start of every program to make sure your staff has an opportunity to ask questions directly from the “horse’s mouth”. We’ll explain what they should say, what they shouldn’t say, and how to use the incentive to their advantage during the sales process. 4. Each sale at Odenza goes through two checks prior to shipping to ensure we understand what you are trying to achieve and that you have the right product. 5. We offer FREE marketing materials for your showroom and free ad designs so that your marketing campaign is on the fast track to success! Once your customers has been registered, one of our travel agents will contact your customer to book their vacation. It’s that easy. Odenza has direct partnerships with major airlines, cruise lines, hotels and resorts worldwide. Our agreements give us amazing prices, but there’s one condition. We can’t sell or advertise the prices we get. That would destroy the “retail” market for our suppliers. In some cases we purchase inventory upto two years in advance to get the very best deals. We package the offers into certificates that YOU can give away, for only pennies on the dollar. On average you pay 1/10th of the price of the retail trip. Furthermore, Odenza generates additional revenue by offering optional upgrades to certificate holders. It’s not uncommon for our certificate holders to bring along family and friends with them when cruising or taking a vacation. Our travel agents can help you and your customers book airfare, car rentals, travel protection, attractions and more all through one phone call. Odenza is an award winning agency and we pride ourselves on customer service. We’re a three time winner of Carnival Cruise Lines’ prestigious Pinnacle Award, which is awarded to a select number of agencies across the United States and Canada. For a full listing of recent customer testimonials please click here. For client testimonials please click here. Have another question? Click here to contact a member from our marketing team.